Apple has released a trio of updates—iOS 12.0.1, watchOS 5.0.1, and tvOS 12.0.1—to fix a few minor issues in Apple’s latest operating systems. In general, we recommend waiting a few days to install these updates unless one of them addresses a specific issue you’re having. However, if you have an Apple Watch Series 4 that’s working fine, you may wish to hold off installing watchOS 5.0.1 for a bit longer. iPad users rejoice: Apple has restored the placement of the “. ?123” key in iOS 12.0.1. In iOS 12, Apple had swapped its place with the Emoji key. 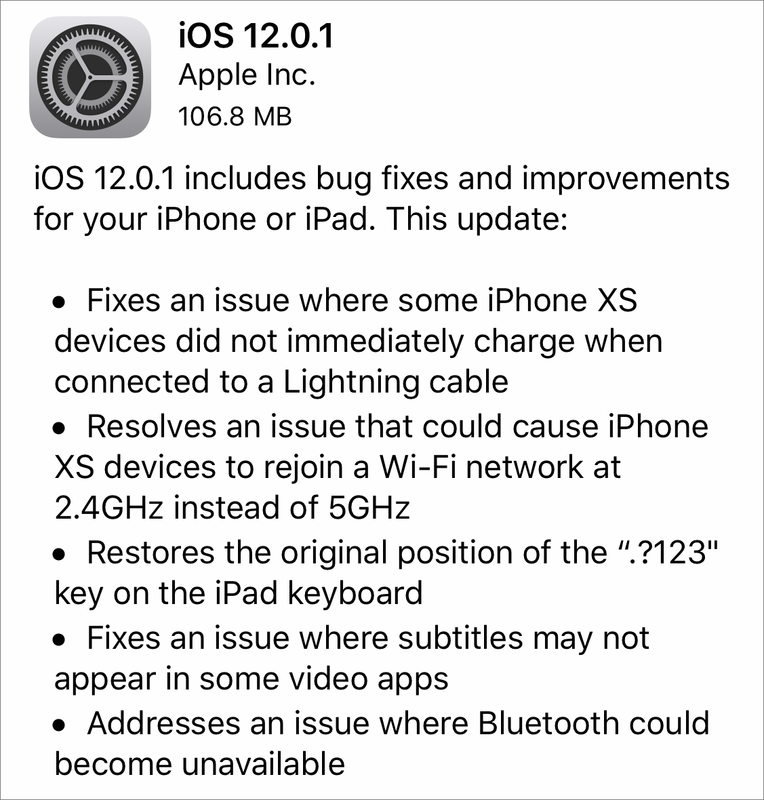 The update also addresses two iPhone XS issues: one that caused it to rejoin Wi-Fi networks at 2.4 GHz instead of 5 GHz and another that prevented it from charging immediately when connected to a Lightning cable. In miscellaneous fixes, iOS 12.0.1 solves a problem that kept subtitles from appearing in some video apps and another that could prevent Bluetooth from being available. iOS 12.0.1 also eliminates two Lock screen-related security vulnerabilities. iOS 12.0.1 weighs in at 80.7 MB on the 10.5-inch iPad Pro and 106.8 MB on the iPhone X, and you can obtain it in Settings > General > Software Update or install it through iTunes. We somehow missed this one earlier—on 27 September 2018, Apple released watchOS 5.0.1 to fix a few minor issues. 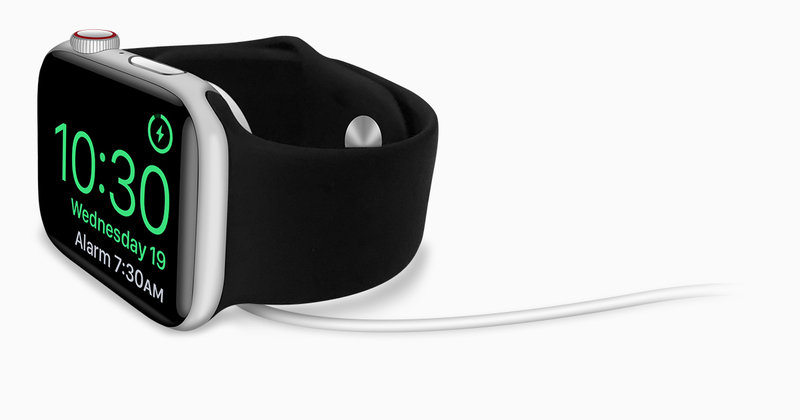 One caused an artificial increase in exercise minutes, another prevented users from receiving stand credit in the afternoon, and a third could prevent the Apple Watch from charging. watchOS 5.0.1 works on the Apple Watch Series 1 and newer, but not the original Series 0 Apple Watch. We have heard from a TidBITS reader who installed watchOS 5.0.1 on her Apple Watch Series 4 and then had it go into a reboot loop. 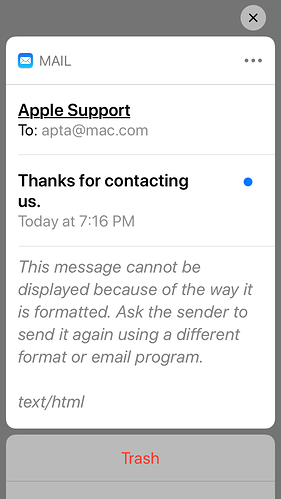 Apple recommended unpairing and re-pairing the watch, and the support rep told her that the problem was being fairly common. Unfortunately, when she restored from her backup, the problem returned, but setting it up from scratch eliminated the crashes. Her husband’s Apple Watch Series 3 had no such problem with watchOS 5.0.1. Also, AppleInsider is now reporting that users of the Apple Watch Series 4 in Australia are complaining that a Daylight Saving Time bug is causing their watches to go into a reboot loop. The problem resolves itself after 24 hours but will likely cause Apple to release watchOS 5.0.2 before Daylight Saving Time occurs in other countries, such as 4 November 2018 in the US. Those of you with an Apple Watch Series 4 that’s working fine should perhaps hold off installing watchOS 5.0.1. 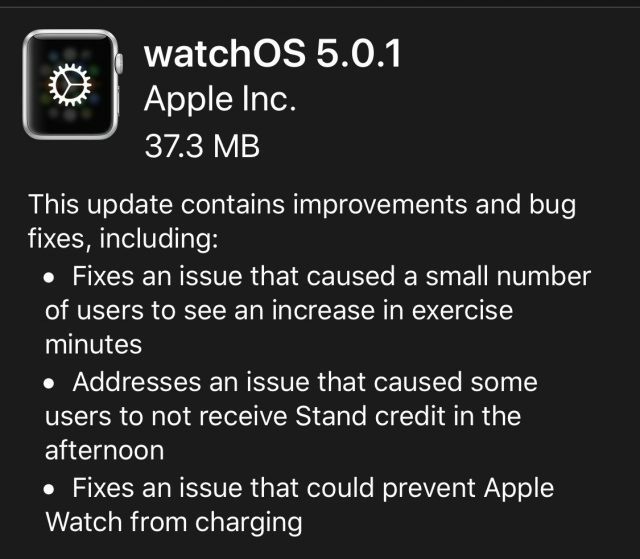 Anyone who does want to run the latest version can install the 37.3 MB watchOS 5.0.1 update using the iPhone’s Watch app (go to Watch > General > Software Update). As is often the case, there isn’t much to say about the tvOS 12.0.1 update, which promises “general performance and stability improvements.” If automatic updates aren’t on, you can update your fourth-generation Apple TV or Apple TV 4K by going to Settings > System > Software Updates. We know of no reason not to update after waiting the requisite few days to see if any problems crop up. I think there is a bug with iOS 12.0.1: if you try to add a Google account in settings / Accounts & Passwords, it walks through all of the steps but just goes back to the accounts & passwords screen without adding the account. I get a notification, too, that a new iPhone has logged in to my account, but the account is never listed. This happened both before and after a restart of the phone. And, one more thing: I wish I knew why Apple won’t just acknowledge issues with an OS version (in this case, the charging issue with the XS models, the WiFi issue with the XS models) and say that they are working on and testing an update that they hope to deliver soon rather than ignoring the issue. 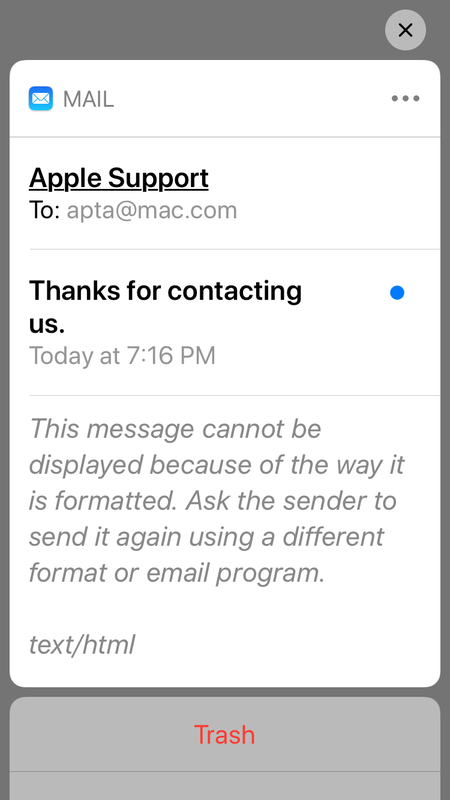 Apple seems to do this a lot. I should have tested on my iPad, running 12.0, before my last post. It’s also not adding a Google account on 12.0. I’m thinking that this is not an issue with 12.0.1 after all? It may or may not be a bug, but I’ve definitely seen a decreased sensitivity to vibration/nudging of my watch (using watchOS 5.0.1) when in Nightstand mode in order to display the time. Before the update, I could simply tap or nudge my night table - or even walk next to it while getting into or out of bed - and the face would light up to display the time. Now I actually have to consciously tap the watch itself. 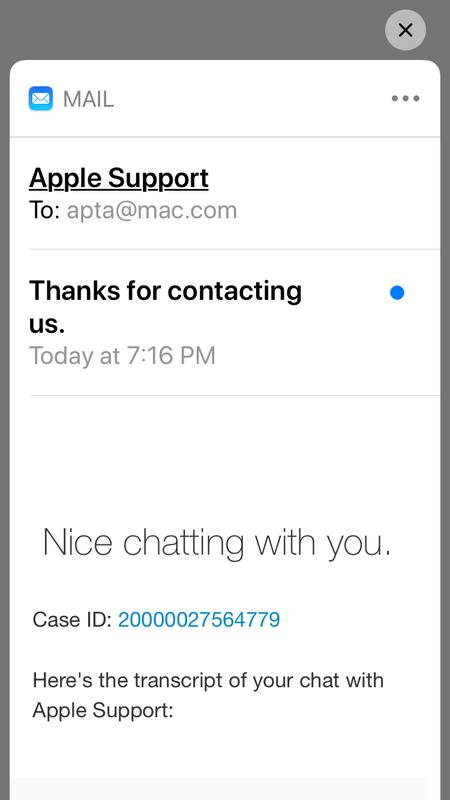 The Apple Support team on Twitter couldn’t tell me anything. Not sure if this is the same problem you’re having, but I was unable to add a Google account that didn’t have an associated gmail account. I wanted to use it for calendar subscriptions. It turns out that you can’t add an account like that through Add Account. I ended up getting it to work, but it involved subscribing to a CalDAV calendar instead. I don’t remember the exact steps but it was fairly easy once I knew what to look for. Adding a Google account on iOS 12.0.1 is now working. Obviously it was some sort of issue that was fixed overnight but just coincidentally started when 12.0.1 was released. Google recently changed some backend login stuff that caused problems for BusyCal and BusyContacts, so I wouldn’t be surprised if there’s still some fallout from that affecting other login scenarios. I wish I knew why Apple won’t just acknowledge issues with an OS version (in this case, the charging issue with the XS models, the WiFi issue with the XS models) and say that they are working on and testing an update that they hope to deliver soon rather than ignoring the issue. Apple seems to do this a lot. The question here is, exactly who is “Apple” and how would they communicate this information? Often, when you talk to a support rep, they’ll tell you if they’re hearing from a lot of customers about the problem, but they can’t know what the development team is working on and the schedule for any fixes, since the company is just far too big. If there is a known fix coming, they’ll tell you that when you call in. 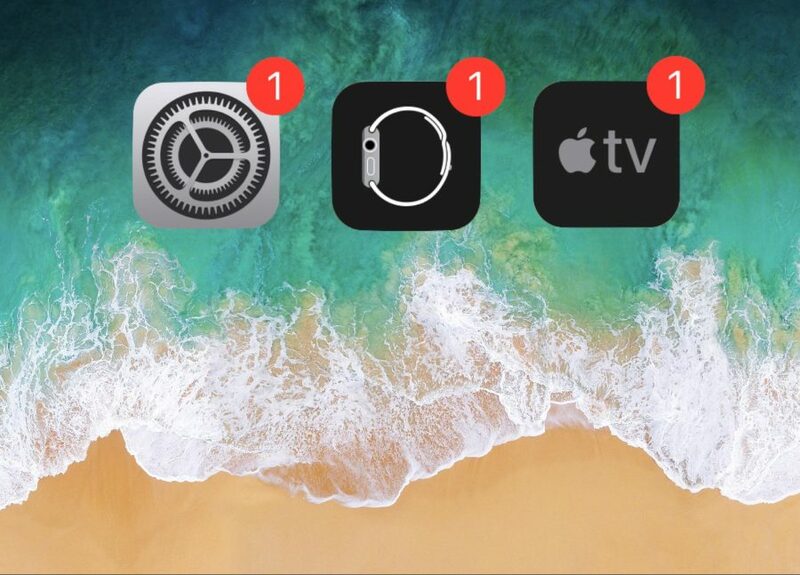 You can report bugs to Apple, and occasionally you’ll get a response that will indicate they know about the bug or are even working on it, but that’s not a great channel either—it would be an insane amount of work to track what’s happening in development and notify everyone who had reported a particular problem. And arguably, the development teams could publish this information, but they’d need to set up and manage an entirely new communication channel to do this. I suspect that it’s not seen as being all that helpful, particularly if they believe the percentage of affected users is quite small. I agree with Adam that release notes should be improved. People who actually read those can be expected to be interested and somewhat savvy. No need to hold back. But IMHO that does not exclude being more upfront about ongoing issues. I don’t think it’s too much to expect Apple to communicate more openly about when they get increased levels of complaints and their devs are working on a fix. I see how marketing might not like that idea, but this is tech so just stick to the facts and trust people to make the right conclusions on their own. I’d have no problems with a release along the lines of “Approximately 1.2% of our XS customers are currently experiencing an issue with XYZ. Our engineers are investigating the reports and presently believe a software fix should be able to alleviate the issue. We expect a patch could be made available by the end of next week. Updates will follow.” Apple could have an internal threshold for the amount of complaints or the level of dev effort required before they craft such a statement. Unfortunately it doesn’t seem to have fixed the problem on iOS 10. Apple coming clean on bugs they are working on … but what would happen to blogs like these where people describe the bugs they have found in Apple products? My Apple TV 4k has updated itself to tvOS 12.0.1 even though it was NOT set to auto-update. Furthermore, after doing the update silently at 1:15 AM (I was sitting in the same room on my iMac while the Apple TV is connected to a projector and will play sound through AirPlay to BeoSound Essence with two Beloab 8000 connected to it, but everything was off, dark and silent). Suddenly, at 1:20 AM, my Beolab 8000 started to play sound aloud. It was not immediately clear where the music came from. I checked my iPhone, the iPhone of my sleeping wife and four iPads. No device was in streaming mode. Well, that’s fascinating. Be sure to keep auto-update off and let us know if it happens again with whatever the next tvOS update is. I’m just at home and double checked the settings: yes, auto-update is OFF. My Apple TV was visually off and has done it silently without any visual feedback (I was sitting in the same room and would have seen any status light on-off or blinks). Furthermore, my problem that audio from the music section in Apple TV is played aloud through the AirPlay speakers when switching it on, is back. I cannot lower the volume until Apple TV has startet completely (about 20 seconds). I already filed a problem at Apple about this. I cannot find a setting for autoplay music. And I never use it for playing music! (I use it for watching TV with Zattoo or Movies from Apple or Netflix). Even with the 12.0.1 update, 3rd party Apps in Apple CarPlay, do not properly function with voice recognition on approved vehicles that do not have touchscreens. 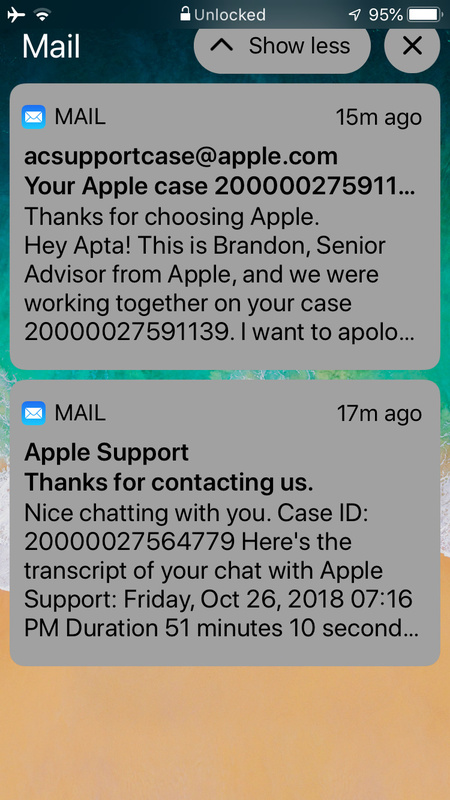 This has been escalated to Senior Customer Relations with a response that it is not Apple’s problem but with the developers of the 3rd party apps. However these Apps function properly with CarPlay disconnected and in fact CarPlay disables iPhone voice recognition when CarPlay is active. This is of serious concern to me as uninformed users trying to use voice recognition with CarPlay on vehicles without touchscreens could lead to driver distraction, unsafe driving resulting in accidents and possible injury or death to the occupants. I regard this as a serious safety issue which Apple refuses to take any responsibility for and has offered me no other Apple channels to which to escalate this issue. My advise: remove 3rd party Apps (Google Maps and Waze so far) 3rd party apps in CarPlay in vehicles without touchscreens until the issue is fixed in order to avoid hazardous driving situations. This is something that Apple has so far refused to do. "This message cannot be displayed because of the way it is formatted. Ask the sender to send it again using a different format or email program. Even more annoying is that for the same message more than one of those messages will appear at different times. Often if I press immediately upon receiving the notification I can see the preview. But a few seconds later if I press the same message I’ll see one of those messages. 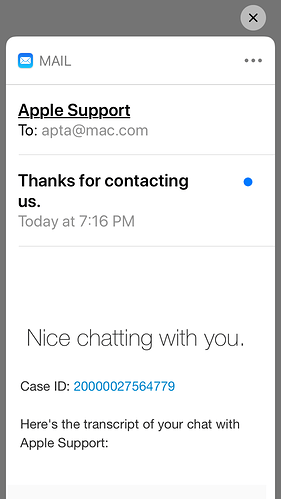 UPDATE: I had a chat session with Apple support. After having the connection dropped twice during active interchanges, the third rep asked me what troubleshooting steps I had taken. I had restarted the phone a couple of times. He wanted me to reset the iCloud mail account. It didn’t make sense since the problem also occurs with other IMAP accounts as well. I was also hesitant to reset the account since invariably I lose messages when the Mail settings are reset to default values upon restoring the account. Moreover I could duplicate the problem on an iPhone 6s that I keep as a spare. The chat session was disconnected once more and I gave up for now. In the meantime I took some screenshots that illustrate the problem. Yes, I’ve just started noticing that too (I don’t get many Mail notifications in iOS) and it seemed sort of pointless to give me a notification without content.